A great teacher once asked "Who are your best students?" Without hesitation, his reply was..."The ones who have played the most scales!" 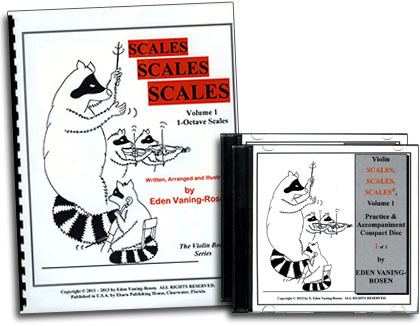 Scales, Scales, Scales by Eden Vaning is the most detailed and most fun Scale Book Curriculum ever! Volume 1 covers one octave, first position scales. The curriculum covers everything a student needs to know to get the most benefit from scale practice, accompanied by two fun CDS. Scales help a student's tone production, finger dexterity and accurate intonation. This book introduces exercises that develop a fuller and richer tone, increase accurate finger placement and create needed muscle memory. The clear illustrations of finger placement further ensure correct intonation. The book is filled with important chapters defining every important aspect, from what are scale patterns, key signatures, and even what are and how to use "ghost notes!" "Finally a scale book I love! I'm having fun." "At last I'm practicing scales right, and I know what to do at all times to improve my scale practice. This is fantastic!" "This is absolutely the most thorough scale book I've ever seen! It's unbelievable the scope of material covered...hurry and get your next two volumes out!" "No one should practice scales without this book!"